OC Mom Activities: More fantastic wine recommendations from fresh&easy! More fantastic wine recommendations from fresh&easy! I love a good glass of red wine. Pair it with a bowl of goldfish crackers (I know only a mom would pair these) and I'm happy as a clam. I grew up in the Bay Area, just a tinsy bit south of Napa Valley. You'd think with that I would be a wine connoisseur with a sophisticated palate and that I would practically spew good wine recommendations. We'll you'd be very wrong! I love a good bottle of wine, but when it comes to being able to explain what I like and the different flavors in a wine? Yeah, not so good. My way of finding a good bottle as a hostess gift or other event is to look at the more expensive bottles and try to decide from the labels what looks good. Or I'll grab one I know I've had before and thought was really good. I know, this is so sad, but I know I'm not alone in this either! Way too many times I have tried something new and been very disappointed with it and vowed to only stick to ones I know are good because I've had them before. I was recently invited to participate in a Twitter online wine tasting with fresh&easy. I was super excited because I have really come to trust their experts opinions on wines. Not only to they search out some fantastic wines to exclusively sell at their stores, they bring them in a absolutely fantastic prices, most of their recommendations come in well below the $10 mark. 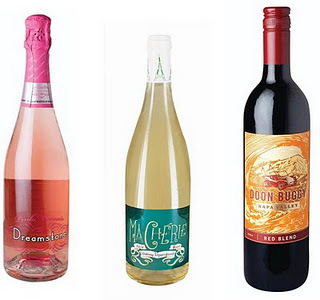 During the online party we were introduced to Doon Buggy Red which comes in just under $10 a bottle was my favorite because I'm a red drinker. We also tasted the Ma Cherie Wine Cuvee which comes in under $8/bottle. And last but definitely not least was the Dreamstone Pink Moscato which also comes in under $8/bottle. I'm normally not a fan of Champagne and other bubbly wines, but the Dreamstone Moscato was really good with just a hint of sweetness but not too overpowering. All three wines would be easy and painless picks to bring as hostess gifts or to have on hand when entertaining this holiday season. All three are also exclusives at fresh&easy stores. In case you don't know where your local one is you can head here. If you are a regular shopper at fresh&easy like me, you may have seen they are now starting a fantastic new rewards program for shoppers. Staying true to their mission, they have made it easy to participate. It's super easy, register to get a card and immediately start collecting points that you can later redeem for CASH once you hit the redeemable points. You'll also never have to print fresh&easy coupons as they easily be loaded on to your card. 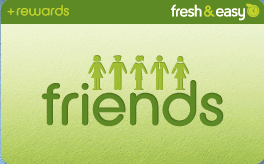 Log in on the fresh&and easy website here to keep track of your points and personalize your card with coupons you can go here. Are you a fresh&easy shopper (fanatic) like me? What do you love about shopping there?